Companies using GEA Westfalia separators and decanters in their operations and looking for significant production and competitive advantages can reportedly now reap immediate benefits from a comprehensive analysis of the actual condition of machines from Applied Consulting from GEA WESTFALIA SEPARATOR. The analysis is said to offer not only a real insight into the operation of individual machines but also enable the highly qualified specialist engineers to demonstrate how availability, efficiency and cost control can be optimised; opening up real opportunities for significant and measurable production advantages. irrespective of the age of the centrifugation equipment or process lines. 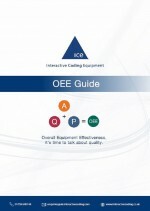 A new guide from coding and marking specialist INTERACTIVE CODING EQUIPMENT (ICE) helps to explain the importance and relevance of Overall Equipment Effectiveness (OEE) in ensuring an efficient production line and also the key role coding can play in its successful implementation.